Winter can be a great time to research new homesteading projects. With reduced demands for yard work and garden maintenance, more time is available for indoor projects. With freezing temperatures setting in, it is also a good time to start baking. With that in mind, the first link this week is to a post on baking traditional German rye bread from Root Simple. Sourdough starter in a mason jar. 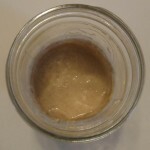 The folks at Root Simple have even provided a video on how to make your own sourdough starter. The video editing is impressive. The instructions have inspired me to make my own sourdough starter. I plant to bake some home made sourdough bread in a dutch oven soon. Are you still researching how to build a chicken coop? I built mine based on the book, Poultry House Construction. But there are plenty of designs out there on the internet. This one has even been made into an attractive info graphic. When you raise your own chickens, you may find eggs with double yolks when the hens first start laying. Have you ever wondered if both chicks would develop and hatch from a double yolker? Youtube has the answer. Watch the video below for the hatching of twin chickens.